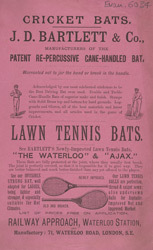 This is an advertisement for J. D. Barlet and Company, cricket bat manufacturers. Cricket has been played in England for hundreds of years and rules were laid down as early as 1744. In 1861 a touring English team travelled to Australia for the first time although the first Test match was not until 1877 when the Australian team won in Melbourne. Before this time there were separate competitions for amateurs and professionals, the Marylebone Cricket Club even hired professional bowlers and fielders so that gentlemen could practice their batting.